Title: The affectionate shepheard. Containing the complaint of Daphnis for the loue of Ganymede. 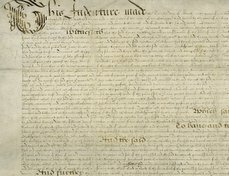 Date: London : Printed by Iohn Danter for T. G[ubbin] and E. N[ewman] and are to bee sold in Saint Dunstones Church-yeard [sic] in Fleetstreet, 1594. The affectionate shepheard. Containing the complaint of Daphnis for the loue of Ganymede. London : Printed by Iohn Danter for T. G[ubbin] and E. N[ewman] and are to bee sold in Saint Dunstones Church-yeard [sic] in Fleetstreet, 1594. 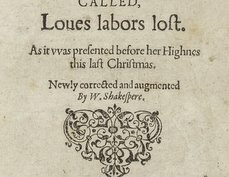 Richard Barnfield’s description of “earth-delving conies” in The Affectionate Shepheard is most likely an early allusion to the “earth-delving conies” in Shakespeare’s Venus and Adonis (1593), line 687 in modern editions. It is hard to say whether these verbal similarities were deliberate or the result of a poetic culture that valued imitatio and the use of common images and tropes. Nevertheless, the similarities here and in Barnfield’s later Cynthia, the homoeroticism of much of Barnfield’s verse, and Barnfield’s praise for Shakespeare in “A Remembrance of Some English Poets” has led some scholars to propose that Barnfield might be the so-called “Rival Poet” of Shakespeare’s sonnets. 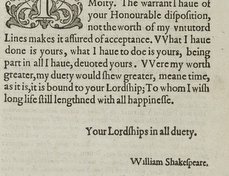 Two copies of The Affectionate Shepheard are known to survive: one in the British Library and another at the Folger Shakespeare Library. 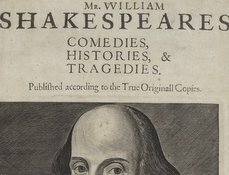 The Folger copy, purchased by Mr. Folger himself, is the one shown here. Charles Charles, “Richard Barnfield, Marlowe, and Shakespeare.” Notes and Queries, series 9, 8.197 (1901): 277–79. George Klawitter, ed., Richard Barfield: The Complete Poems (Selinsgrove: Susquehanna University Press; London and Toronto: Associated University Presses, 1990). Sonia Massai, “Barnfield, Richard (bap. 1574, d. 1620).” in Oxford Dictionary of National Biography, online ed., edited by Lawrence Goldman. (Oxford: Oxford University Press, 2004) <http://www.oxforddnb.com/view/article/1487>. Sasha Roberts, Reading Shakespeare’s Poems in Early Modern England (New York: Palgrave, 2003).